A US contractor who has been in jail in Cuba for more than four years has gone on hunger strike, his lawyer says. 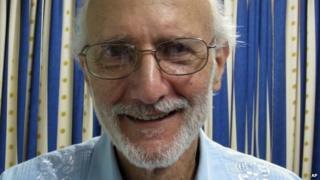 Alan Gross, 64, said he began fasting on Thursday to protest his treatment by both the Cuban and US governments. Mr Gross is serving a 15-year prison sentence for taking internet equipment to Cuba. The case of Mr Gross is seen as a major obstacle to better US-Cuban ties. The two countries have not had formal diplomatic relations since 1961. "I am fasting to object to mistruths, deceptions, and inaction by both governments, not only regarding their shared responsibility for my arbitrary detention, but also because of the lack of any reasonable or valid effort to resolve this shameful ordeal," Mr Gross wrote in a statement released by his lawyer on Tuesday. "Once again, I am calling on President Obama to get personally involved in ending this standoff so that I can return home to my wife and daughters,'' he added. Mr Gross's wife Judy said she was "worried sick" about his health and that she did not believe "he can survive much more of this". His family says Mr Gross has lost more than 45kg (100lb) since he was detained. He started his hunger strike as news emerged that US government aid agency USAID was behind a text message service set up in Cuba that was allegedly designed to foment unrest. The service, called ZunZuneo, was reportedly designed to attract a subscriber base with discussion initially about everyday topics such as sport and weather. US officials then planned to introduce political messages to spur the network's users into dissent from their communist-run government, the Associated Press reported last week. The project is said to have lasted from 2009-12 when the grant money ran out. Mr Gross was arrested in 2009 while working for a USAID subcontractor setting up internet access for Cuba's small Jewish community. Scott Gilbert, the lawyer representing Mr Gross, said that it was "shocking that USAID would imperil his safety even further by running a covert operation in Cuba". "USAID has made one absurdly bad decision after another. Running this program is contrary to everything we have been told by high-level representatives of the Obama Administration about USAID's activities in Cuba," Mr Gilbert added. On the fourth anniversary of his arrest in December, Mr Gross wrote to President Obama to say he feared the US government had "abandoned" him.